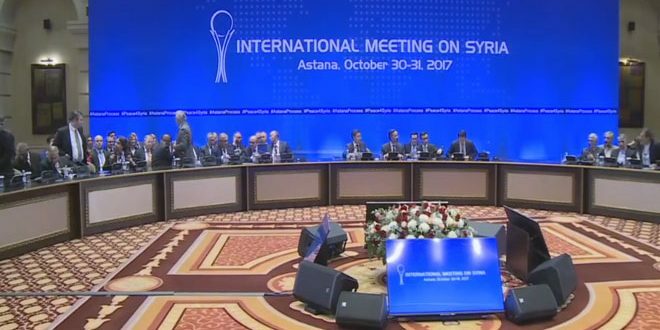 Astana, SANA-The guarantor states renewed commitment to territorial integrity of Syria, fighting terrorism and preserving the cessation of hostilities in de-escalation zones. “The guarantor states of Russia, Iran and Turkey are committed to Syria’s territorial integrity, reduction of violence and preservation of ceasefire in de-escalation zones,” the final statement, read out by Kazakh Foreign Minister Kairat Abdrakhmanov, affirmed. The statement highlighted the progress made in fighting ISIS, Jabhat al-Nusra and other groups associated with these terrorist organizations, calling for unifying efforts to combat terrorist organizations outside the de-escalation zones. It affirmed that the solution to the crisis in Syria is political, based on UN Security Council No. 2254, providing appropriate conditions to launch a national political dialogue within the framework of Geneva platform and under international supervision in addition to the Russian initiative to hold a Syrian National Dialogue Conference. The statement underlined the need to take firm measures to consolidate confidence and solve issues related to abductees with stress laid on the importance of delivering humanitarian assistance and providing safe corridors for aid delivery. It also noted that the guarantor states will continue their efforts to hold the next round of talks in December. Abdrakhmanov hoped that all parties would oblige to the provisions agreed upon in Astana 7 meeting, reaffirming that his country’s willingness to continue its efforts to help solve the crisis in Syria. Head of the Syrian Arab Republic delegation to Astana 7 meeting, Bashar al-Jaafari stressed that Syria welcomes any UN role to solve the crisis in Syria, based on neutrality, guaranteed by the UN Charter. In a press conference following the final session of Astana 7 meeting, al-Jaafari said that Syria is a UN member, respects its Charter and believes in the UN key role to find solutions. “The UN began to restore its balance as the friendly major powers started to have essential role,” added al-Jaafari, noting that the impartiality principle is mainly based on respecting the sovereignty of all states. He added that the states’ sovereignty mainly depend on their constitution, which means the constitution in Syria that is decided by the Syrian people, he said. Al-Jaafari, said that Turkey wouldn’t commit to its obligations in line with the de-escalation zones agreement, noting that this matter was discussed with the Russian and Iranian guarantors. “During this round, we met with the Russian and Iranian sides. Our meetings were always constructive and fruitful, and we talked about Astana 6th meeting and what was and wasn’t implemented in it,” al-Jaafari said. He pointed out to the agreement reached in Astana latest meeting on establishing a de-escalation zone in Idleb province on condition that “the armed factions”, located east of Abu al-Dohour, would withdraw 3 km to the west of this road and that all sides will participate in combating Jabhat al-Nusra and eliminating it, internationally classified as a terrorist organization, and that Russia and Iran will send observers to supervise the cease-fire in that area. 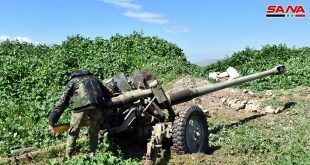 “But, what has happened since Astana 6th meeting is that the Turkish forces infiltrated with their armored vehicles, in cooperation and coordination with Jabhat al-Nusra, into the Syrian territory in contrary to its obligations under the agreement of de-escalation zones among the guarantor states,” al-Jaafari said. He added “We raised that issue with the Russian and Iranian guarantors during this session and they affirmed to us that all the guarantors must abide by their commitments,” al-Jaafari said. Al-Jaafari went on to say that the Syrian Arab Republic considers the presence of any military forces on its territory without the approval of the Syrian government as an occupation and aggression, and it will be dealt with on this basis. The US military presence in Syria is aggression and occupation, said al-Jaafari, adding that the Foreign and Expatriates Ministry issued an official statement and sent it to the UN Security Council in New York in which it considered the U.S. military presence and the hostile actions committed by the so-called international coalition as aggression on Syria’s sovereignty. He reaffirmed that Syria, since the beginning of the crisis, is open to all initiatives that would contribute to halting the blood shedding in Syria and end the unjust war waged against its people, noting that Syria has taken the initiative to hold a national dialogue conference since the very beginning of the crisis in 2011 and has repeatedly reiterated its support to hold dialogue, moreover despite feeling that the submitted initiatives have not led to any concrete results, the Syrian state has spared no effort to push forward dialogue mechanisms. 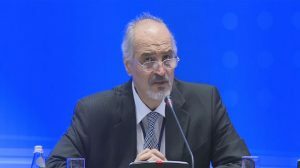 Regarding the Syrian National Dialogue Conference and where it will be convened, al-Jaafari said that the conference is the outcome of continuous talks and coordination between the Syrian and Russian sides, taking into account the progress made on the battlefield and the retreat of terrorists in Syria which increased the possibility of holding such a conference, stressing the Syrian government’s readiness to take part in it. He pointed out that Syria was the first suggested place to host the conference, then Russia has been chosen as there are several groups whose political decision is related to foreign sides that won’t allow them to attend a conference that is sponsored by the Syrian state, not to mention the confidence we have in Russia as a guarantor state which has defended and always defends Syria’s sovereignty, unity and territorial integrity. Earlier, the Syrian Arab Republic delegation held a meeting with Kazakh Foreign Minister Kairat Abdrakhmanov in Astana on Tuesday in the framework of 7th Astana meeting on Syria. Both sides discussed issues of the agenda of Astana-7 meeting, in addition to assessment of what have been achieved in Astana-6 meeting held last month. A close source to the meeting told SANA correspondent in Astana that difficulties and obstacles which hindered implementation of the outcomes of Astana-6 meeting, particularly in regard to establishment of de-escalation zone in Idleb, were also touched upon during the meeting. The source said that the Syrian Arab delegation briefed the Kazakh side on the latest developments in Syria, particularly pertaining to fighting terrorism. Both sides agreed on continuing communication till the end of activities of Astana-7 meeting to come out with best possible outcomes, according to the source. Earlier, delegations of the guarantor states, Russia, Iran and Turkey, held a tripartite meeting. An expert-level meeting was also held for discussing issues of the agenda of Astana-7 meeting which is scheduled to wrap up activities with a plenary meeting today afternoon. On Monday, the Syrian Arab Republic delegation headed by al-Jaafari held two separate consultative meetings with the Iranian delegation headed by Iranian Assistant Foreign Minister for Arab and African Affairs Hossein Jaberi Ansari and the Russian delegation headed by Russian president’s special envoy to Syria Alexander Lavrentiev.